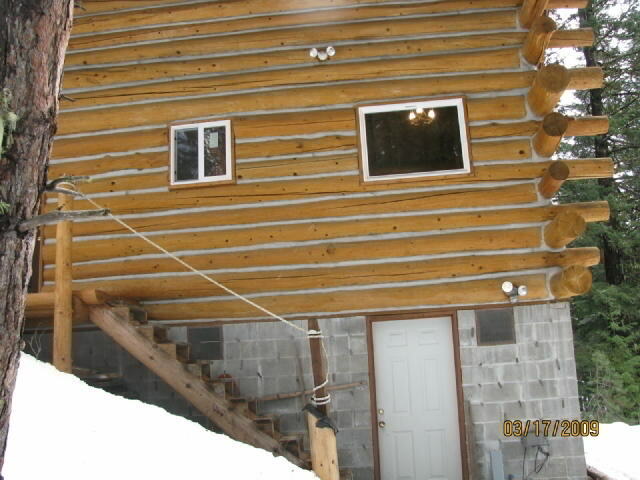 The major projects for 2009 were to finish all the chinking inside the building, install most of the lighting circuits (except for in the bathroom and the crawlspace), and nearly finish installing the loft staircase. 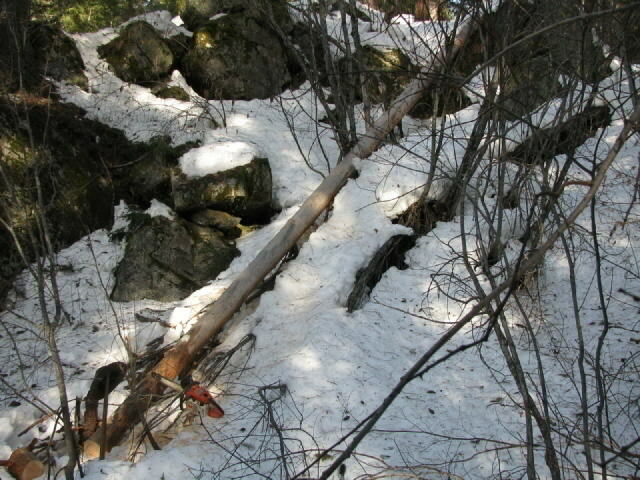 1/14/09 This log fell over the cliff some time ago and after cutting into it, I decided that it is a good log that I want to harvest. After spending a morning on it, I decided to wait until later to try to move it. 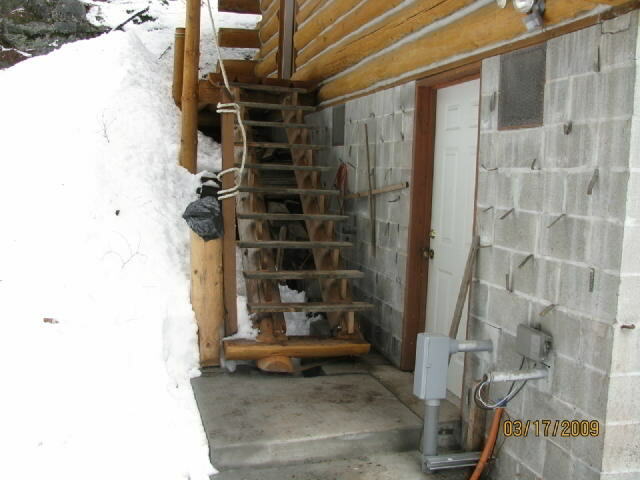 3/18/09 This is the temporary back staircase I installed on 11/11/08. 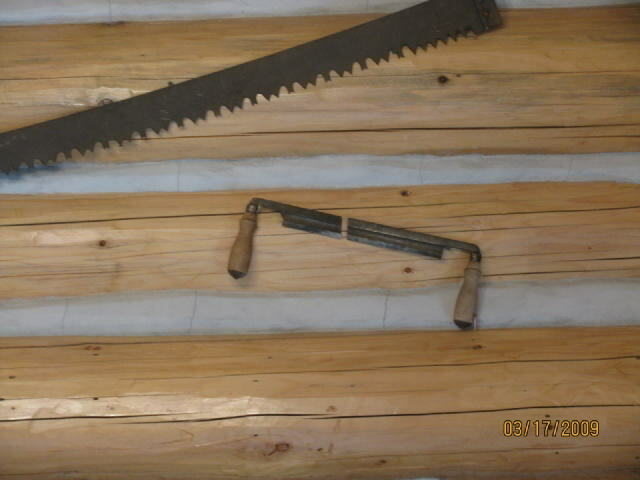 The treads are the old risers used in the forms for the concrete staircase and they will serve until the real log treads get installed. The rope handrail was installed on 12/17/08. 3/18/09 In this picture, you can see the back staircase but over the crawlspace door you can also see the motion sensing light I installed on 2/25/09, and the flood light high up on the middle of the wall. 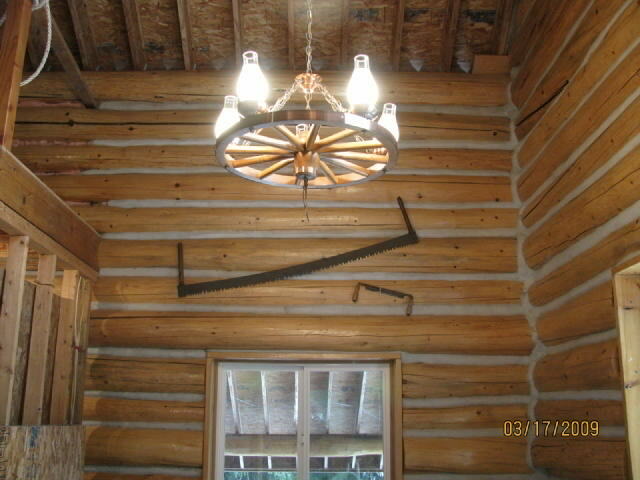 It was installed on 2/24/09. 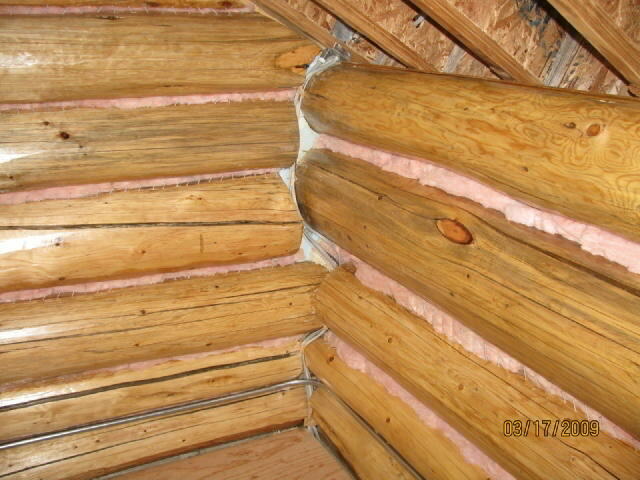 3/18/09 Here the electrical wires have been tucked into the Grid E1 corner of the loft ready to be covered by insulation and chinking. 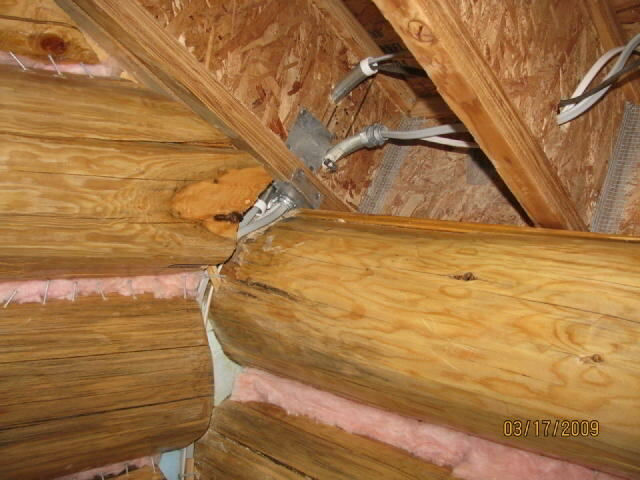 3/18/09 This detail shows how the wires take a mouse-proof route from the wall to the ceiling. 4/16/09 This is the scaffolding I used to work on the front of the central column to install the loft staircase light fixture. The scaffold tower goes around the column and straddles the corner of the loft floor. 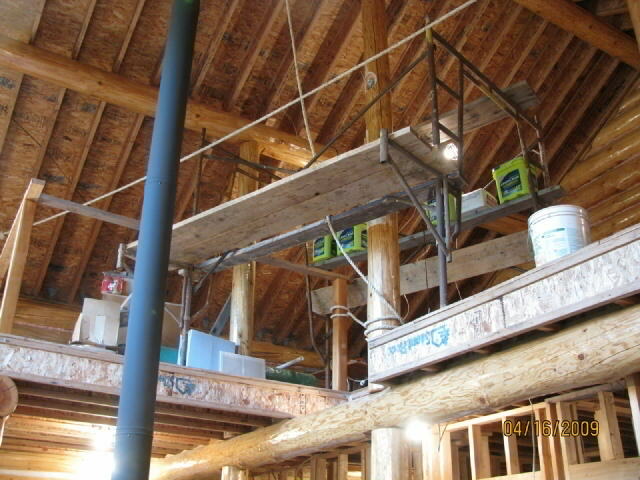 The planks are set on cantilever brackets hanging from the tower some 18 feet above the main floor. 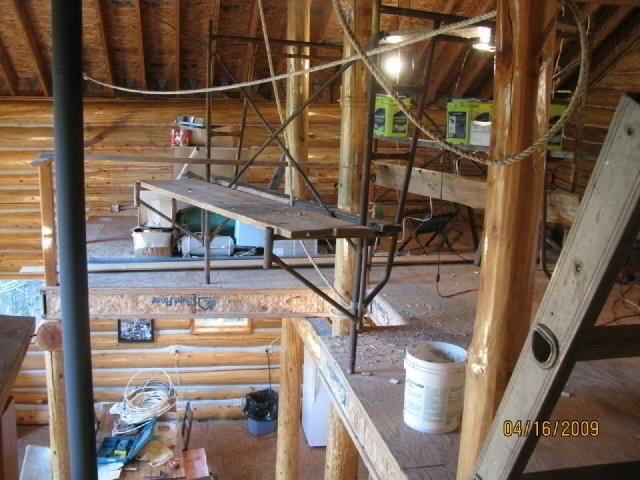 4/16/09 This is a view of the scaffolding from up in the loft.